Predator 8x42 is rated 4.7 out of 5 by 33. Rated 3 out of 5 by okrim from Great binos however... Bought these just over a month ago and am really satisfied with their image clarity. For the price they are an awesome pair of binoculars. I use them for hunting and they really do make animals pop out. My only gripe with these is that a month or so in and the eyepieces are already scratched, a scratch proof coating should definitely be applied on these for the future. I've had other binos for years and years and they still don't have a single scratch. I always brush off the glass then use micro fibre so it's not in the way I'm cleaning them. They should be more rugged, a month and scratches isn't acceptable for hunting optics. Great binos I'd have given them a 5 if they were more rugged. Warranty has been contacted so waiting for a reply to see what they can do for me. If it wasn't for the scratches I'd give these a 5/5. Rated 5 out of 5 by tim4NH from Initial thoughts on my Steiner Predator I have just received these binoculars and have been playing with them and comparing them to a pair of Vortex Crossfires. I thought the Vortex were nice, I still do. But in comparson, the Steiner Predators are clearer. How I define clearer is when looking out to the edges, there is no blurring with the Predators. I didn't really notice this until I did look thru the Steiners, there really is a difference. Of course they have been great for leaf peeping. Plus, I got a great deal on these. Rated 4 out of 5 by pruman from Well made, outstanding bargain. A great set of 8x42 roof prism binoculars. Unique coatings, specifically geared towards the hunter. Compared to other 8 x 42 bins in the mid-priced category, a stellar product. Easily one of the best bargains on a binocular of this quality, anywhere. My only issue is Steiner is so little known in the birding community. Well, well known in the tactical / military realm, but very little presence in the birding community, which is a shame because their product is on par with any of their peers. Rated 5 out of 5 by Donnie M from Great Product - Great Company I had a pair of Steiner Predators that I picked up somewhere around 1999-2000. I work for a police department in Texas and they have come in very handy over the years. They are simply the finest pair of binoculars I've ever used. The years of constant use took a toll and the focus was just a little off. I contacted Steiner and they offered to repair them for free if I'd send them in. About 2 weeks after Steiner received my binoculars I received them back via UPS. To my amazement Steiner had replaced my Predators with a new pair of the same. Steiner did this with no fan fair of any kind. The entire process from contacting them to the point I receiving them back was seamless. The quality of their customer service equals the quality of their product. I am a customer for life! Thank you Steiner !!! Rated 5 out of 5 by Bpilot from Best Hunting Binoculars I have ever owned !! I had purchased a used pair of these binos shortly after they were introduced and immediately fell in love with them. I used them extensively for hunting and wildlife stalking excursions with absolute fantastic results. This past whitetail season in Pa. I had my predators along and had a mishap that ended with my prize binocs sliding off a rock ledge and into the Lehigh River. Sick about what had happened I knew I had to have another exact pair. That's how good they were. I scoured the Internet and called Steiner to help me find a Dealer who might have a pair of these left in stock, since they are not being made anymore. I finally located a pair of new in box in Missouri at Binocular Specialists. They were great folks to deal with and they gave me a great deal. I had them within three days and once again i'm enjoying the Best Hunting binocular money can buy. Steiner's are the best value, dollar for dollar !! Rated 5 out of 5 by robin48 from Excellent optics for the money These binoculars provide a lot of value for the money . I have owned high end binoculars from Nikon , Pentax . Burris and Bauch & Lomb . So i have quite a bit of experience with other brands . In their price range these are excellent binoculars . Nice sharp images due to the quality lens . Would highly recommend these binoculars . Rated 5 out of 5 by crow from From competators mini car to a Jet in comparrison Tested last fall for long range Moose Hunting in Northern Ontario. Peformed wonderful. Chrisp clear images that youi can,t compare to other products. Very pleased with the Steiner Optics. 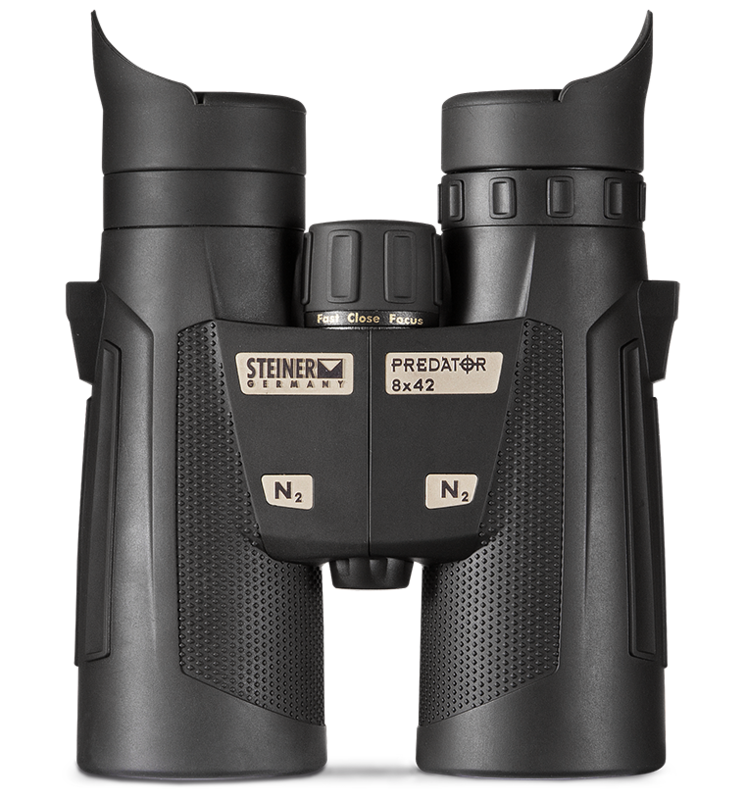 What is the difference between the 8x42 predator black - and the 8x42 predator green binoculars? is it just a color difference? Yes it is strictly cosmetic. Is there a extreme pro series ? I go on-line and fine a variation in prices of 200 dollars. Can you explain? The Predator Xtreme and Predator Pro are older models. They've been discontinued for quite some time, but they are very similar to the current Predator line. I am looking to purchase a quality binocular in the next year or so. I'm possibly considering Steiner. The question I have is under the heritage warranty if the product gets accidentally damaged is it covered under the warranty ? What is the difference between the Predator 8x42MM 2443 and the Predator Pro 8x42MM? The Predator Pro is simply an older version of the Predator - the differences are purely cosmetic in nature. Can i wear glasses and use these? Are the side eye shades flexible at all? Yes they will fold down. I have the Steiner Predator Xtreme 8x42 model 2481 , and I am looking for a chest strap. Where can I get the chest strap/ harness? Is there a tripod attachment for Predator 8x42? What is the exit pupil size ? I can't find a technical spec sheet on these?